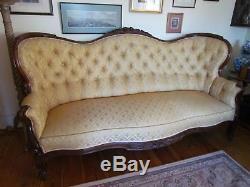 A large Victorian settee / sofa measuring 81" wide; 43" tall; and 37 deep. Upholstered in gold coloured fabric. The item "LARGE VICTORIAN CARVED MAHOGANY GOLD COLOURED SETTEE / SOFA (Ref3131)" is in sale since Friday, October 5, 2018. This item is in the category "Antiques\Antique Furniture\Sofas/Chaises\Victorian (1837-1901)". The seller is "toby0711" and is located in Sidmouth. This item can be shipped to United Kingdom.